Consider these three panels from October 1975 issue of Teen Confessions, a comic book published by Charlton Comics. Then bang your head against an available wall. It gets worse. In the next two panels, Jill states: "Nick is an egghead sometimes. Ellen's smart as a whip too! I'd do ANYTHING to get Nick ... even STUDY!" And never mind what I'm doing with a 39-year-old copy of Teen Confessions. It's all in the name of blog research, people. Blog. Research. 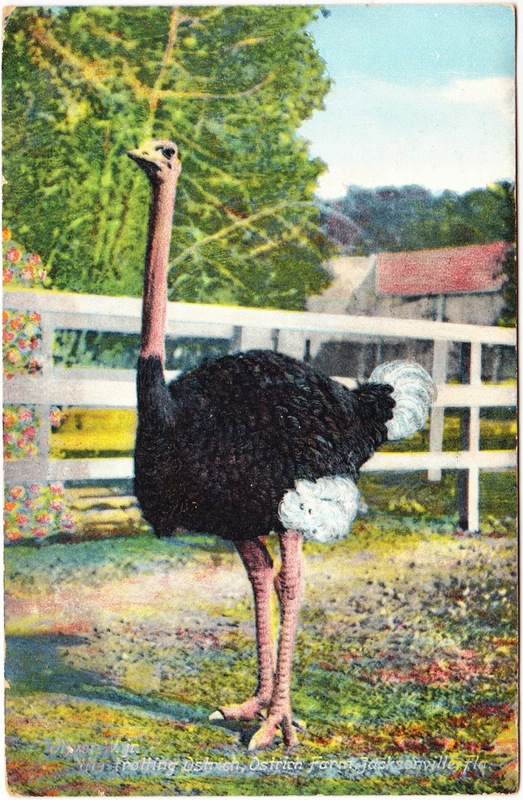 So here's your "Sunday Night Ostrich," in the form of a vintage postcard. the trotting Ostrich, Ostrich Farm, Jacksonville, Fla.
Oliver W. Jr. was apparently A Big Deal. According to someone who left comments on that Shorpy page, "From what I've been able to dig up, Oliver W. Jr. was named after a cousin of Theodore Roosevelt who made a locally-celebrated visit to Jacksonville sometime shortly after the turn of the 20th century." If you're interested in learning more about the Florida Ostrich Farm in Jacksonville, Duke University has a nice collection of vintage advertising images and ephemera from the former business on its website. We are going to take a trip 180 miles up the St. Johns river, will take us 2 days. Are well, Bev."